This book is a great one if you want to show your kid how those backyard science experiments relate to real-world applications. You can buy a book or a kit that shows you how to sit down with your kid and make a simple condensation still, but this book will show you the correlation to an oil refinery, the biodiesel carbon cycle, and even step it up to an nuclear fuel gas diffusion enrichment, centrifugal enrichment, and nuclear energy simulations! I mean where else are you going to not only show your kid how nuclear fuel is processed, but also simulate that process with household items! 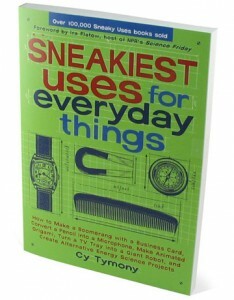 There are a whole line of “sneaky” books, but I like to start with the sneakiest. But if you’re interested in working backward, there’s also Sneaky Uses, Sneakier Uses, and even Sneaky Green Uses books available as well. This entry was posted on Thursday, January 7th, 2010 at 11:18 am	and is filed under Reviews. You can follow any responses to this entry through the RSS 2.0 feed. You can leave a response, or trackback from your own site.